While it isn’t officially spring yet, the warm(ish) weather we’re getting this week has inspired us! Make sure your March comes in like a Lion (Bear Fox) so it goes out like a lamb. 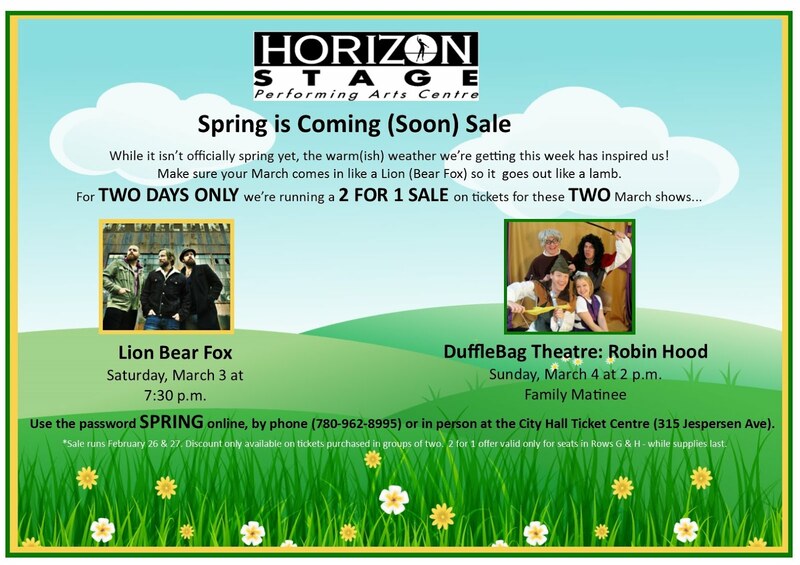 Lion Bear Fox on March 3 and DuffleBag Theatre: Robin Hood on March 4. Use the password SPRING online, by phone (780-962-8995) or in person at the City Hall Ticket Centre. *Sale runs February 26 & 27. Discount only available on tickets purchased in groups of two. 2 for 1 offer valid only for seats in Rows G & H - while supplies last.